Optional extra gold sparkle added to flower lollipops. These unique and eye catching edible flower lollipop favours make stunning wedding and event favours. 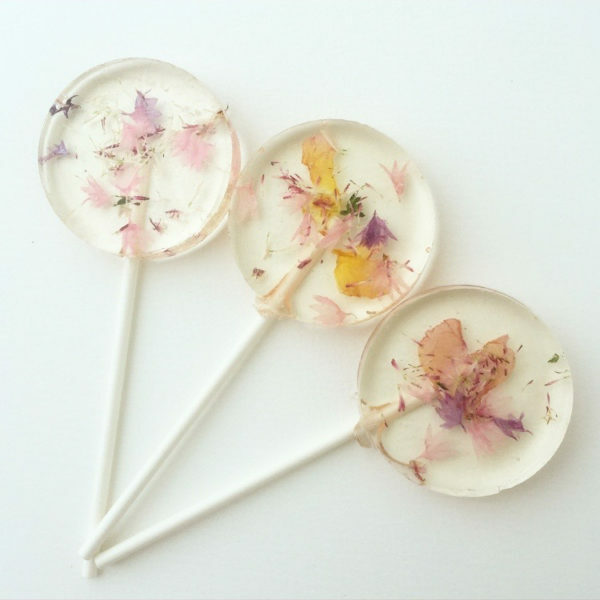 These beautiful lollipops come wrapped in individual clear cellophane bags. Small, blank, stamped or custom card tags are available to purchase. 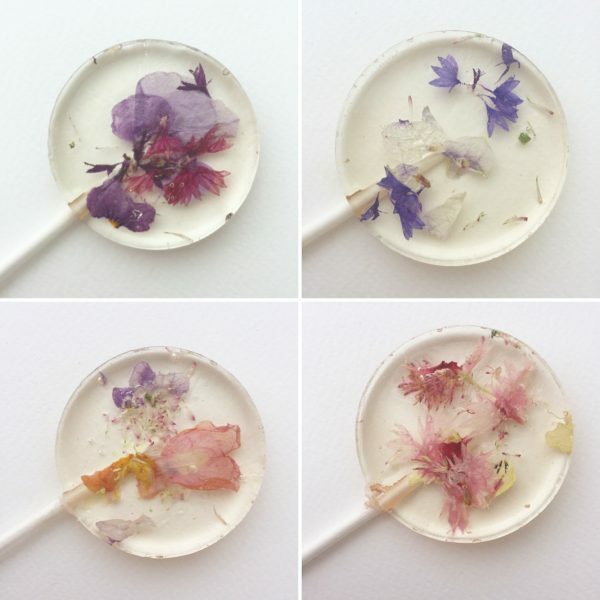 My edible flower lollipop favours come mixed in a wide variety of colours (one colour flower options are available for an extra charge) and flavours including vanilla, cotton candy, marshmallow, coffee, watermelon, rose and champagne. Please get in touch using the contacts page for a specific colour or flavour not listed in the option menu. Thank you so much for the gorgeous lollies. They tasted fabulous & looked perfect on the table as favours. We ordered these lollies as it was something different as a favour & dressed the table elegantly. Thank you for the gorgeous lollipops and amazing customer service. My query was addressed on time, got a call back immediately. Order came in less than a week in time for my daughter’s birthday. They were given as favours and we had a very thrilled bunch of 11 year olds!! After buying the Heart lollies with gold dust, I couldn’t resist buying these flower lollies as a gift to my couples in keeping with my nature themed photography packages. They are gorgeous and taste amazing. lots of happy couples with their sweet treats. We can’t thank you enough for our stunning wedding favour lollies. After coming across the little lollipop shops flower lollies with the little blue cornflowers in we were over the moon. Blue cornflowers are the symbol logo for MND Scotland, a charity which is very close to our hearts. As our wedding neared the little lollipop shop called us to let us know that the cornflowers weren’t blooming and they were devastated to let us know. But they managed to source 10 of the most beautiful little cornflowers we had ever seen and made us some stunning lollies with them. Thank you so much for going out your way. We truly are very greatful and we can’t wait to share them with all our wedding guests. Amazing. 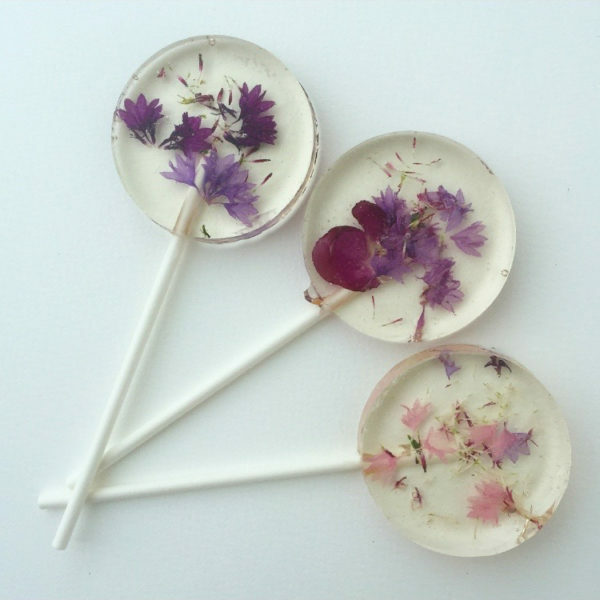 Absolutely gorgeous lollipops! I bought them for my subscription box and everyone loved them! So pretty it’s a shame to eat them. Thanks very much. And daisy class , the lollies had yellow and white flowers and the girls found them magical ! Thank you for the Amazing flower lollipops for my daughter’s wedding favours. They were stunning and everything we expected them to be and more. They were definitely a talking point. Such efficient service too. Thank you. We absolutely loved our edible flower heart shaped lollies for our wedding. We used them as our name settings as well and I thought they added to the style beautifully. They were something everyone could enjoy as they’re vegan too! They are an excellent size and the marshmallow flavour was delicious! Definitely recommend. My lollies looked absolutely stunning and really added a special touch to the floral boho wedding we had! I would definitely recommend and will be ordering more for our 1st anniversary as me and the hubby never got one! Only grumble was the delay in delivery, there was a worry I wouldn’t get them in time despite ordering them months in advance! Not stress that I needed 2 days before my wedding but it all worked out! 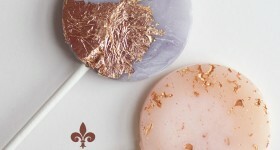 The lollipops were absolutely gorgeous – both in look and taste! The guests were so impressed by them as favours and the venue staff remarked on what a nice touch they added to the decorations. Wonderful customer service too! I can’t praise you enough, Thank you so much! 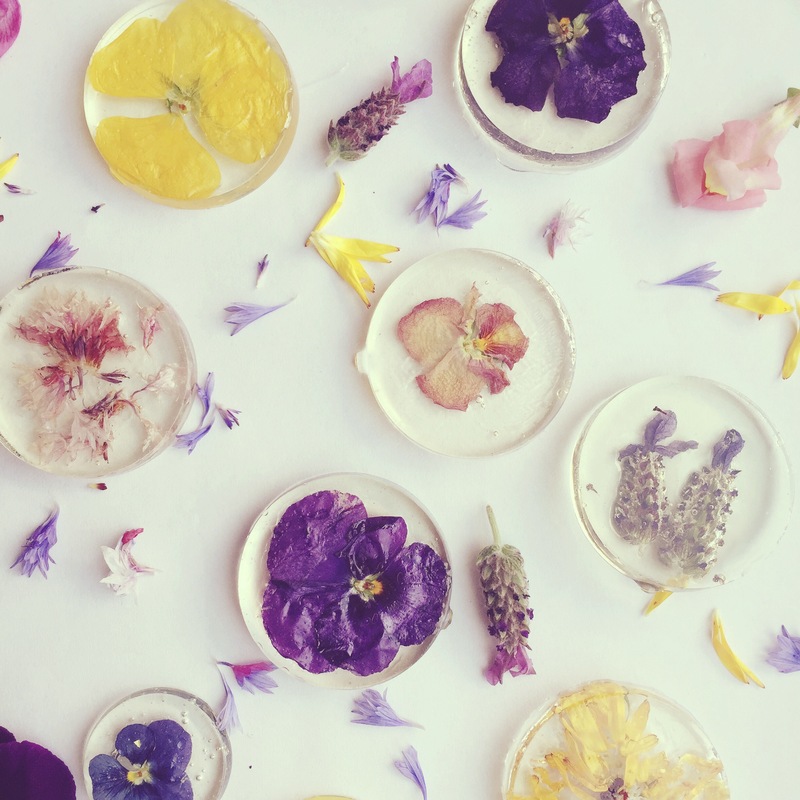 Thank you for the absolutely beautiful edible flower lollipops! Everybody was amazed and loved them! They are perfect and I’m definitely going to recommend your Little Lollipop Shop 🙂 Thank you from Germany! 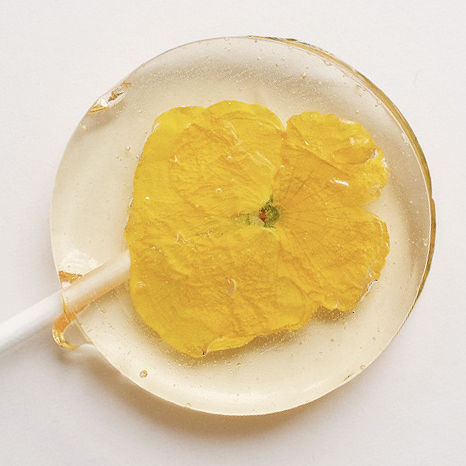 Absolutely beautiful lollipops, and wonderful communication. Not a single lolly didn’t look fantastic, and many wedding guests commented on how beautiful they were. Thank you so much! Thank you so so much for the beautiful lollipops. They looked absolutely amazing as place settings for our wedding. It was so nice to find something so different! These lolli pops were the finishing touch to our wedding! I am a florist so everything was covered in flowers, having flowers inside the lollies was just perfect! Our order went missing originally and Joe was so helpful and my lollipops arrived in perfect time! Could not reccomend enough! Incredible,tasted great,looked beautiful and arrived intact being very well packaged.Would recommend everyone to try them. Beautiful looking, deliciously tasty. They were the perfect favour for our wedding day. Thank you. Made for excellent wedding favours and delivery on time – thank you very much, our guests loved them and they fit so well with our ‘colourful’ wedding theme. 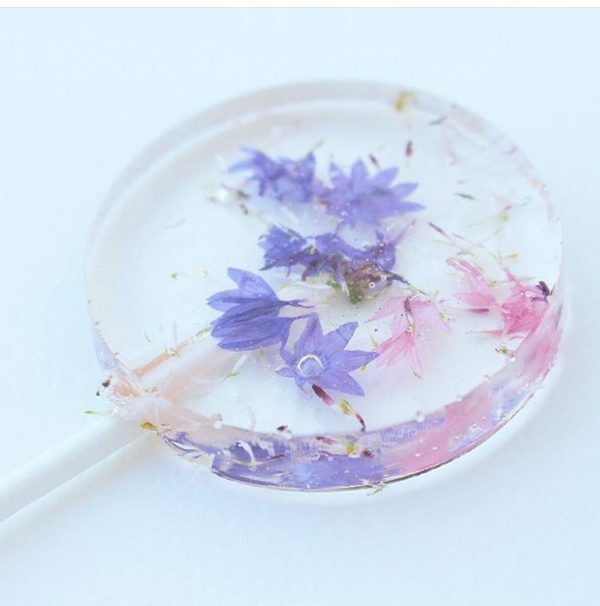 I ordered 100 of the edible flower and glitter lollipops for our wedding favours and everyone absolutely loved them! They looked amazing, and though I had a few problems with my order fairly close to my wedding date, The Little Lollipop Shop could not have been more helpful. They went out of their way with personal service and ultimate dedication to make sure my order was perfect in the end for my big day. Thankyou so much.